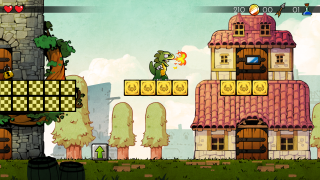 A remake of the classic platformer with handsome new art. If you'll permit a little nostalgia, Master System platformer Wonder Boy III: The Dragon's Trap was one of the first games I ever played set in a world rather than a series of levels; it opened my mind to new possibilities as a kid, and after playing it, I was always a bit disappointed by platform games that had more traditional linear levels—all that felt very dated, suddenly. If you're not familiar with the game, it's essentially a proto-metroidvania, boasting an interconnected world that gradually opens up as you acquire the ability to transform into a variety of anthropomorphic animals. Mouse Man can climb up walls, for example; Hawk Man can fly; Hu-Man...I can't remember what Hu-Man can do, but he's human, so he's got that going for him. There's no release date yet, but you can check out more charming, characterful screenshots on the official site.